Four enterprising USC undergrads recently contacted me about a business they were helping start up. The four students are part of an entrepreneurship class as part of their studies at USC's Marshall School of Business. The students expressed an interest in a gluten free consumer in Los Angeles and luckily they happened upon my website and contacted me. I recently met with the students on USC's University Park campus and spoke with them about what I looked for in products as a gluten free consumer. The students are helping a chef launch Virtula Bakery, dedicated to creating gluten free baked goods. During our meeting I learned more about the baker, who wished to remain unnamed until the bakery is fully ready for lunch. One student, Elton, told me that he had combined two class assignments into one to help the baker behind Virtula Bakery succeed in her business plan. As part of that, they have been approaching various retail stores in Los Angeles to stock Virtula Bakery's goods. They are currently waiting to have an official business kitchen in which to cook and then will hopefully be able to sell their goods to stores (the exact details were lost on me). I say "hopefully" because I really enjoyed the samples the group provided me of the "Truffle Brownie" product. A bag of 5 (or 6?) of these products would normally retail for $5, a totally reasonable price for gluten free baked goods in my opinion. Better yet, these were delicious! They were very rich and would go great with a glass of (almond/soy/cow/your preference) milk. As part of the students' project, they were required to earn a profit of $500. They have already exceeded that in earning a profit of over $600 by selling to USC students, retail shops (to sample the products), and other sources. Trojans know how to do it right! More than anything, the "Truffle Brownie" sample given to me made me excited to try out more of Virtula Bakery's products. As of right now, you can add yourself to the mailing list to keep up-to-date about the Bakery's progress. I'm looking forward to seeing Virtula Bakery's products in more stores soon! UPDATE: If you are interested in buying the "Truffle Brownie," you can e-mail nisusgroup@gmail.com directly. Enjoy! After work the other day I went over to my friend Hilary's place to spend the evening watching a predictably cheesy movie with some wine and dinner. She lives close to the Whole Foods at 3rd & Fairfax so we took a nice evening stroll to WF to see what the store had available for our dining needs. Hilary is great to eat with because she is totally gluten-free friendly. Some of my other friends jokingly refer to their food as "human food" alongside my gluten free food, but Hilary never turns her nose up at my imitation pasta and bread. She's an equal opportunity foodie, you could say. Anyway, we opted for pizza. Unfortunately this particular evening was a late night so no pizza places were still for us to pick up. 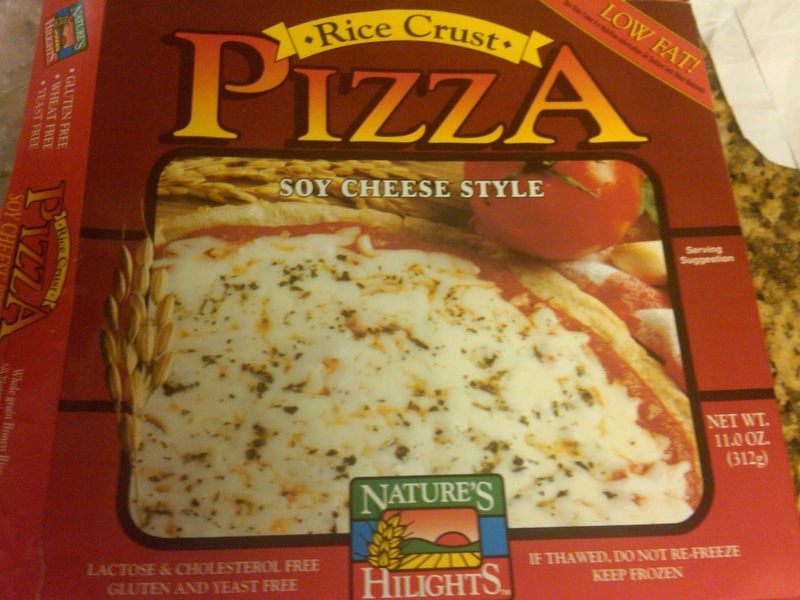 We looked through the gluten free freezer section and chose the Nature's Hilights Rice Crust Pizza, which is lactose, cholesterol, gluten and yeast free. Turns out it is is also taste free. This was not a good pizza. Don't let that delicious-looking picture on the box fool you -- this pizza is really one of the worst. Of course this is just my opinion (and I would love your reactions below). The crust was extremely thin, thinner than a fingernail, and the cheese had no flavor. The sauce didn't add anything either. It's too bad -- when we first opened the pizza it looked great. We were definitely burned by this pizza. This option is a last resort for me... honestly, even if I were craving pizza and this was the only thing on the shelf, I don't think I would pick it up. I would just delay my craving and pick up a pizza later on. This doesn't approximate gluten-filled pizza in any way. You can also whip up your own pizza using Trader Joe's Brown Rice Tortillas, as that is what this pizza crust tasted like. That way you'd be able to spice it up with your own toppings! I finally, FINALLY made it over to Chelsea Market to check out Friedman's. It has been so long since I first heard about it and so many people have recommended it that during my last trip to New York, I knew I had to make it a point to get there. My sister and I actually happened upon Chelsea Market on a cold day in New York; neither of us had been in and, since we were two blocks away, we decided to take a walk through it. 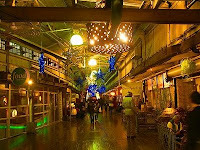 We were pleasantly surprised to find that it is a large, indoor market with lots of different food options. It's a great way to walk around and stay warm while braving the bitter winter in New York. The Market serves up options for vegans, vegetarians, gluten free folk, and carnivores alike. A few days after my sister and I originally explored the Market, I had an afternoon to myself to wander the city. I went down to Chelsea Market with a mission in mind: to finally sample Friedman's. Luckily once I arrived, I was very happy with my meal there! 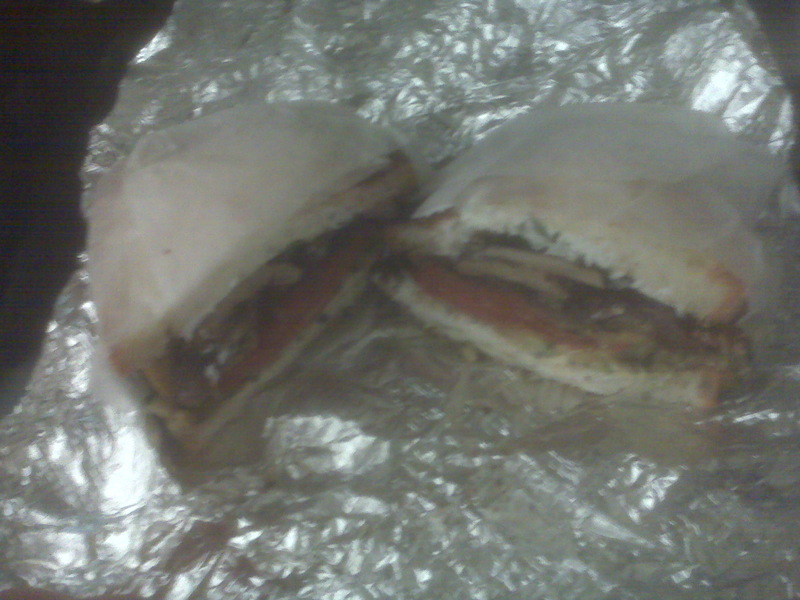 I ordered the Grilled Vegetable Sandwich on gluten free bread (which costs an extra $2.25, of course). The 'wich came with hummus, sprouts, shredded carrots, tomato, cucumber & avocado on grilled gluten free bread. You can also add turkey or chicken for $2.50. I know the above picture is grainy and can't communicate the sandwich's taste, but I assure you that it was delicious. The bread was crispy and had been lightly grilled to perfection. Many of the gluten free breads I have eaten over the years are crumbly and tough, thus not providing good sandwich-making material. The bread at Friedman's was much lighter and didn't fall apart upon first bite. I would definitely visit Friedman's again for a gluten free sandwich, despite the $2.25 surcharge on gluten free customers. I suppose it is just something we have to get used to... even though every time it sees such a surcharge, my wallet trembles. 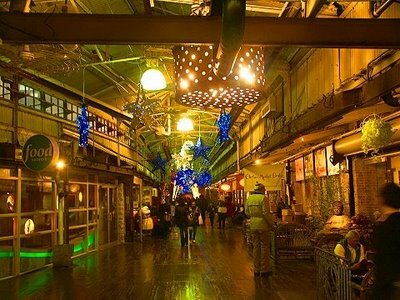 If you get a chance, check out Friedman's and the Chelsea Market on a day when you would prefer to be inside in New York. The Market is a great cold or rainy day activity and Friedman's is a perfect way for gluten free folk to have a sandwich that may just remind them of the days when they could consume gluten without repercussion. Think Thin! as I guess they were going by back then has since updated its look to a cleaner, more modern design which I think complements its gluten free nature better than the old packaging. Rachel has offered to give three (3) lucky winners a pack containing: ten (10) protein bars, ten (10) crunch bars and two (2) boxes of bites. Whoa! That is a lot of bars and bites. These bars are great to travel with and the bites are great snacks to get you through your day. My favorite bar is the White Chocolate Chip bar, although I am a big fan of the new crunch bars. So now you are probably wondering how to enter. It's simple! Leave a comment below answering one of the three below questions along with your e-mail address or some way to contact you and you'll be entered to win! This contest expires February 14th at 5pm. 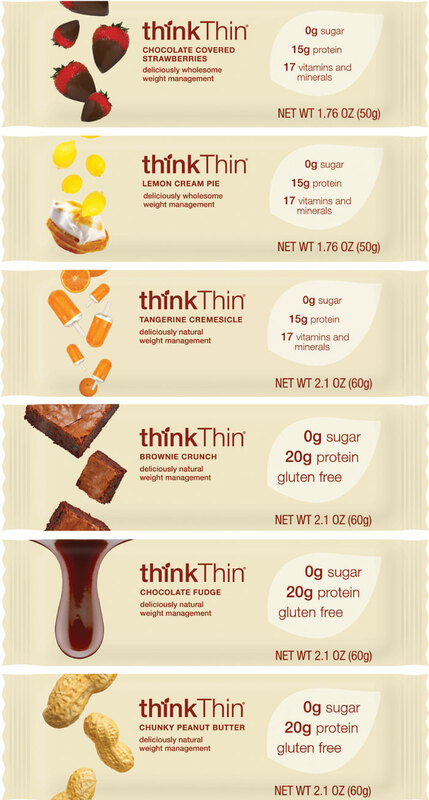 (1) Which flavor would you like to see ThinkThin introduce? 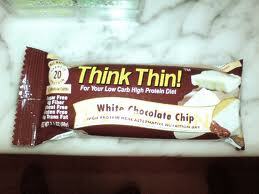 (2) What is your favorite ThinkThin flavor? (3) How do you incorporate ThinkThin products into your day? Good luck! I look forward to reading your comments. 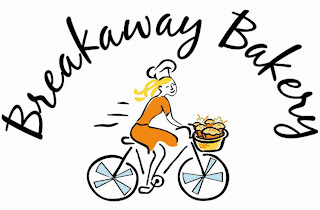 Earlier last week I was invited to check out Breakaway Bakery, a new gluten-free spot in Mid-City. Well, I'm not sure if it's Mid-City... but that is what I'm going to go ahead and call it; it's on Pico Boulevard between Hauser and Cochran -- a great location for me as it is on my way to school! My friend Lindsey had recommended that I visit Breakaway back in December, but with an extended winter break in Arizona, at home and in New York City, I just recently managed to visit Breakaway. The Bakery derives its name from the idea of "breaking away" from unhealthy foods and many of the top allergens (wheat, soy, peanuts, etc.). 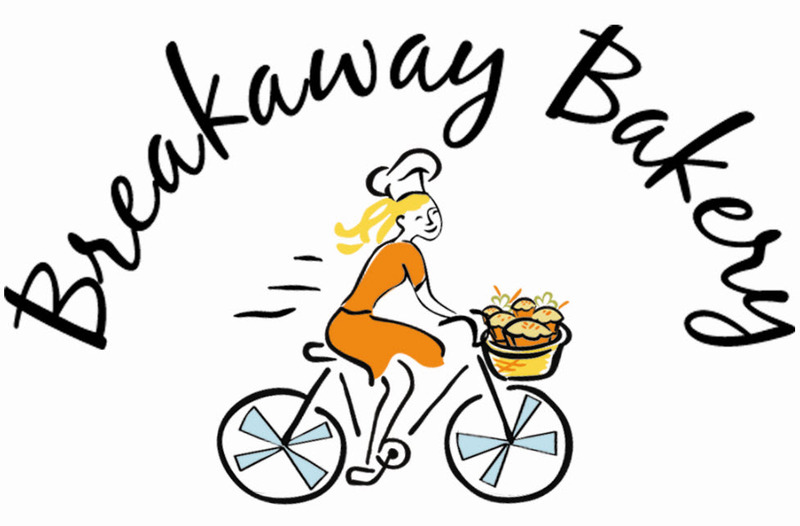 Janice's husband is also a cyclist and you can see the cyclist influence in the bakery's logo below. As I walked into the bakery I was warmly greeted by Janice, the owner, and Krystal. My eyes were feasting on all of the delicious-looking treats the store beautifully displays in glass cases on the main counter while Janice talked to me about some of their products. I had trouble focusing but I somehow managed to focus on Janice and take my mind off of the amazing scones, raspberry crumble bars, chocolate mint scouties, and other assorted baked goods. Janice informed me that the bakery does not use any refined sugar or agave in their products. This is a big difference from many other bakeries which Janice attributed to the fresh-on-the-market nature of agave. She expressed an interest in researching agave more before deciding whether to include it in her baked goods. The bakery's products also provide eaters with substantial servings of whole grains, as the bakery uses only organic brown rice flour instead of pre-made flour mixes. The bakery is also peanut, soy, and gum free and is Kosher Pareve. On that note, please be mindful of the bakery's hours -- they are not open on Saturday because of their Kosher certification! I first visited on a Saturday and was disappointed to see that they are not yet open on Saturdays. The bakery is very new, however, so this could change. That was a lot of information; what you are probably wondering by now is whether the bakery's products were good. I can answer with an emphatic yes. What I most enjoyed about Breakaway, and what I believe separates it from other gluten free bakeries, is that it doesn't focus on cupcakes. I think this is a smart move on Breakaway's part; while you regular readers know I'm a sucker for cupcakes, I truly enjoyed Breakaway's products which included organic fruit. I sampled a lil' chocolate mint scoutie, a raspberry pinch, a snickerdoodle, a brownie, a scone and the raspberry crumble bar. My favorites were the raspberry crumble bar and raspberry pinch; both were delicious. I haven't had a similar treat in a long time, probably since becoming gluten free. The fresh fruit flavor was amazing along with the great texture of the pinch surrounding the raspberry. I also loved the snickerdoodle and lil' mint scoutie -- the scoutie tasted like what I remember a thin mint cookie tasting like! Thin Mints were always my favorite of the Girl Scout cookies so it was a nice throwback to the days in which my sister was a Girl Scout. Breakaway also offers vegan treats; I had an oatmeal raspberry cookie that was out of this world! Of course I made a huge mistake -- I didn't take any pictures! I'll update this post with pictures; in the meantime check out the bakery for yourself and leave me a comment letting me know what you think.